Japan Matsuri is the closest you can get to a real Japanese Festival in London! 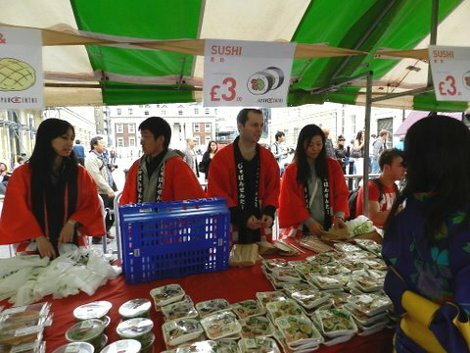 A celebration of all Japanese food and culture, Japan Matsuri will have stalls selling a huge variety of authentic Japanese food & drinks and various arts & crafts. There will also be three stages with a fantastic selection of performances such as Japanese music, martial arts, ikebana flower arrangement and taiko drumming, definitely something to appeal to everyone! Is Japan Centre Going to Be There? Of course! Japan Centre will have a bigger stall than previous years so that you can get as much delicious Japanese food from us as possible. Takoyaki is a firm favourite at all Japanese festivals so we hope to make the day truly authentic with our own takoyaki, made from grilled balls of dough and filled with octopus! You can also find freshly made healthy sushi, sweet breads like melon pan from our bakery, Japanese green tea and a variety of snacks such as Pocky and rice crackers. 10% Off Voucher You Say? We had a fantastic time at Japan Matsuri and hope you all did too. 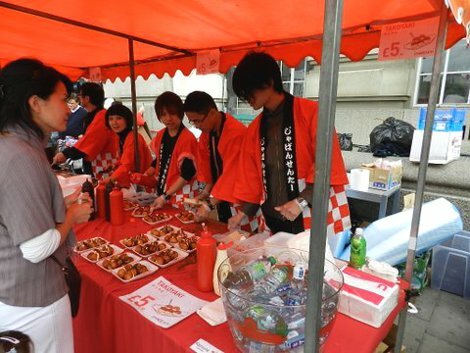 Here are two photos from the Japan Centre stall where you can see the sushi and takoyaki that we had available!